SCVHistory.com HM7502 | Saugus | Bonelli House Interior | Pink Ladies Recruitment, 1975. 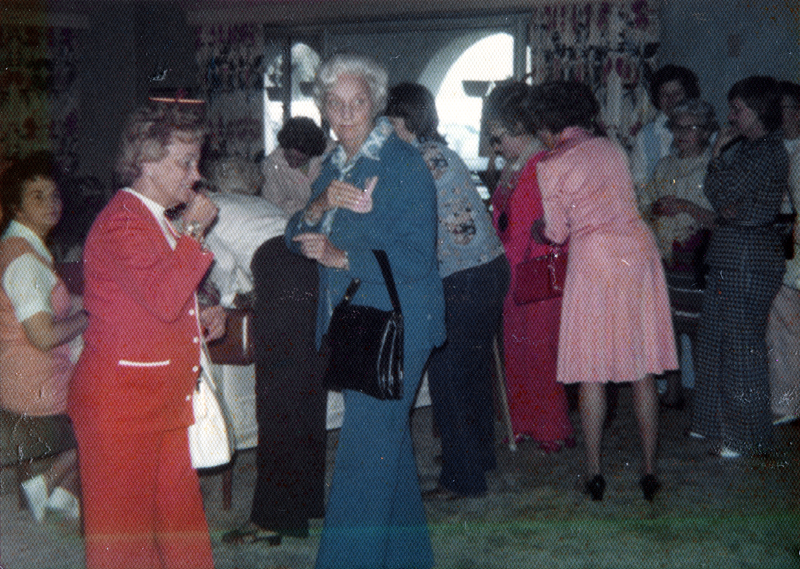 1975 — Joyce Bonelli hosts a volunteer recruitment tea in her home (the "Bonelli House") on the Bonelli Ranch shortly before the opening of Henry Mayo Newhall Memorial Hospital in 1975. The event was organized by Volunteer Coordinator Joyce Wayman. Members of the Women's Auxiliary were known as the Pink Ladies. The Bonelli House was the home of Joyce (Aug. 30, 1923 - Apr. 15, 2001) and her then-late husband Dr. William G. Bonelli Jr. (Dec. 9, 1922 - Feb. 22, 1972), son of the "original" Bill Bonelli (1895-1970). Dr. William G. Bonelli Jr. served on the first College of the Canyons Board of Trustees. The Spanish-style house stood just east (southeast) of the oval track of the Saugus Speedway, which the Bonelli family owned. Today (2015) the location would be the southwest (west) corner of Soledad Canyon Road and Commuter Way, the access road to the Santa Clarita Metrolink Station. The house was razed in the late 1980s. About Saugus Speedway / Bonelli Ranch. HM7502: 9600 dpi jpeg from original photographic print | Collection of Henry Mayo Newhall Hospital.